Non-knitters, kids especially, like to ask: What are you knitting?" And it's often a gauge swatch. Which leads to the inevitable: "What's a swatch?" Knitting gauge is key to all knitting. Even the most humble square gets its size from its gauge. Knitting patterns will often include the phrase "to save time, check gauge" or they will tell you to change your needle size "to achieve gauge". And yet, is there a knitter alive who is not guilty of ignoring this advice at least once? It really is true: checking your gauge will save time. However, it is only true if you check your gauge thoroughly and acurately. Even a small difference in gauge can make a garment inches smaller or larger. The gauge swatch is a sample square or rectangle, knitted with the yarn and needles you are going to use for your knitted project. Gauge refers to the size of each stitch, and is usually talked about in terms of stitches and rows per inch, or, stitches and rows per 4 inches. Here's a visual demonstration of the importance of gauge. The top illustration represents 26 stitches with a gauge of 4 sts per inch. 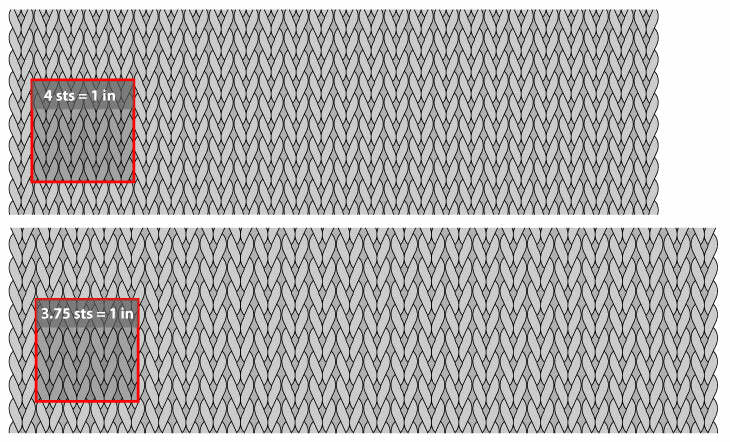 The bottom illustration represents a slightly fatter gauge of 3.75 sts per inch over 26 stitches. Note how much larger the bottom illustration is over 26 stitches. Over a large area, the difference would be even more substantial. This basic method is good for trying out a yarn to see how it works. It is adequate for projects that don't rely on gauge, like scarves. It is not ideal for garments. lay your sample flat, do not stretch it, and count how many stitches and rows fit in 4 inches. We often have a goal gauge in mind, or we know from personal experience that we knit loosely or tightly. adjust your needle size up or down according to your goal gauge. (For example, if the label says 20 sts = 4 inches on 4.0mm needles, and your goal is 22 sts, try a smaller needle, like a 3.5mm). cast on enough for 6-8 inches, using the yarn label's gauge. when the swatch is dry, count how many stitches and rows fit in 4, 5 or 6 inches. Follow the same steps for the thorough gauge swatch, use double-pointed needles or circular needles. at the end of each row, transfer the knitting from your right to left hand without turning it, slide your stitches to the right end of the needle. Pick up the yarn (which will be at the left side of the work), drape it loosely across the back of your work, and knit with it. If there is any texture in the pattern you are using, even if it's a simple ribbing at the edge, test it in your swatch. For example, if you are planning to knit a sweater that uses a smaller needle size for the ribbing, do that in your swatch. Test both stocking stitch and any stitch patterns in your swatch."